Ember attack during a bushfire. 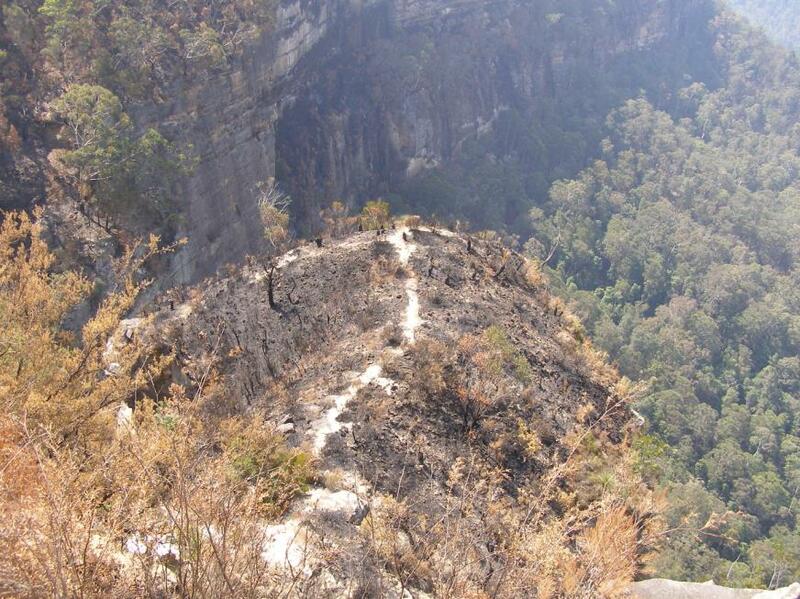 Part and parcel of choosing to live in the Blue Mountains is that, by being on ridge lines surrounded by Eucalypt forests, many properties are inherently exposed to bushfire threat. Whether bushfires be caused by lightning (rarely), accidentally by people, RFS-prescribed, or by arson (usually); bushfire risk management is a community responsibility – not just the lot of RFS volunteers. The arson threat aside, “residents, landowners and land managers of the Blue Mountains need to accept that they are in a bushfire prone area and their properties may be subject to ember attack when threatened by bushfire.” (Blue Mountains Conservation Society Bushfire Policy). To dispel a rural myth, not all native habitats recover from bushfire. Certain species and old growth flourish only in ecosystems that are never burnt. Post-bushfire regrowth often spawns dominant species like Eucalypt and Acacia, whereas original biodiversity may take centuries to recover. Bushfire is often a precursor to infestations of grass and weeds, and if followed by intense rain, also a catalyst for eroding irreplaceable native soils. The antique premise ‘hazard reduction’ has become spin for pre-emptive burning that is prone to escaping out of control and so itself a hazard. Slashing and bulldozing under the premise of ‘Asset Protection Zone’ is also proving to be ineffective against ember attack and wildfire. But like arson, the hazard reduction and APZ theories contribute to the net loss of important habitat. Proven effective and sustainable is early detection and response to ignitions. Most artificial fires start on developed land, so this in where the control measures should be focused – maintenance of gardens and guttering, retrofitting houses with materials and defences to resist fire, planting fire-retardant hedging around houses and implementing counter-measures recommended by Australian Standard AS3959. The future of sustainable bushfire risk management starts by preventing houses being built where they cannot be safely protected from bushfires. Effective ‘hazard reduction’ is investigating and catching the arsonists. I welcome RFS BM Superintendent’s response (BMG 4-1-06) to my letter (‘Premises at Risk’ BMG 16-11-05) and him challenging two of many researched points I raised. In reply, my statements were not “misleading”. 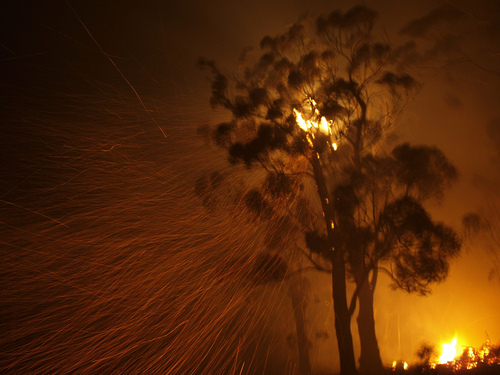 RFS’s own research confirms that most bushfires are caused by arson. Of 466 investigated fires in NSW (2001-2004), 296 (64%) were determined to be the result of deliberate ignition and the most prominent cause of significant bushfires. (Australian Institute of Criminology, Bushfire Arson Bulletin, 16-8-05). In reply, an RFS ‘Asset Protection Zone’ will not stop a raging wildfire “with flames of up to 30m” nor stop embers carried by hot “60kph” winds well ahead of a wildfire front (Woy Woy). Burning/bulldozing bush, before arsonists get to it, is flawed logic. 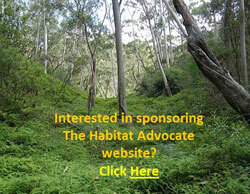 How many hectares of habitat would need to be destroyed to insulate bushfire-prone property from wildfire? Wildfires need not be inevitable. Wildfire fronts are often caused by an excitement-motivated arsonist’s multiple ignitions linking up. I unreservedly commend the dedication of RFS volunteers each Summer. But habitat-destroying strategies applied by RFS bushfire committees each Autumn-Spring hark to 1940s solutions and are as ineffective as they are environmentally destructive. ‘Hazard’ reduction assumes a direct relationship between wildfire risk and the total area burned. But ‘hazard’ reduction does not significantly reduce wildfire risk. In 2003, the Auditor General of Victoria identified in his audit on fire prevention and preparedness, that “the relationship between hazard reduction burning and the overall wildfire risk is currently limited”. Mal, no-one said solutions were simple. But to be effective, bushfire risk management must focus on the root causes – by (1) seriously resourcing investigation into bush arson, and (2) ambulance-speed detection and suppression of spot fires – else we do “invite disaster”! Our World Heritage need not be a wedge victim between ‘hazard’ reduction and serial arsonists. 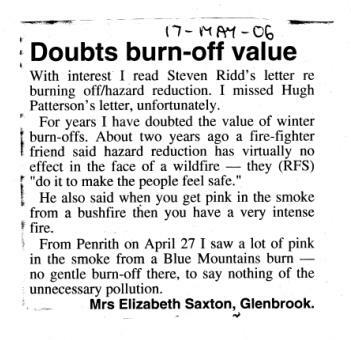 I welcome Hugh Patterson’s public input into the environmentally destructive practice of ‘hazard’ reduction (BMG 5-4-06). Conspicuously, none of the repeated research refuting the fallacy that ‘prescribed’ burning and bulldozing native habitat prevents wildfires, is disputed. 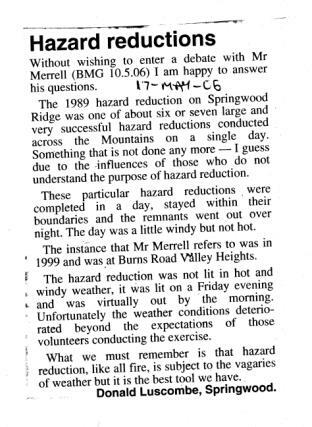 Hugh claims the Mt Hall bushfire in 2001 could not be controlled. But the coronial enquiry noted: “prescribed burns had been done… only two years and four months earlier” and “the ability of the fire to leap or bound many hundreds of metres at a time.” Reconfirmation that ‘hazard’ reduction does not prevent wildfires. Why was the initial spot fire at Mt Hall not detected sooner and standby airborne water-bombing deployed? Resourcing is clearly available when bushfire co-ordination committees can command millions in federal funding each year to perpetuate ‘hazard’ reduction – an unquestioned tradition dating back over 50 years. Last year these committees squandered $1.3 million ‘hazard’ reducing 3785 km2 of National Parks habitat, 565 km2 of Crown Land, and a further 391 km2 of local council-owned lands across NSW. ‘Hazard’ reduction is blatant land clearing. Worse, ‘mechanical’ hazard reduction (ie: bulldozing) permanently destroys habitat. Anyone else – farmers, developers, would attract severe penalties as environmental vandals. But these bushfire committees operate immune from EPA prosecution, write their own rules and code with eco-friendly jargon then call in the bulldozer anyway. The discretionary millions deserve to be invested in effective detection and airborne suppression of spot fires, not squandered on finding something for volunteers to do over winter, which wildfires leap over anyway. According to the mayor of Junee last summer, “if it hadn’t been for the water-bombing aircraft half of Junee would have gone”. Anyone arguing to divert scarce grant funding away from effective airborne fire-fighting and to justify futile habitat destruction doesn’t have a moral leg to stand on. In the 1940s, ‘hazard’ reduction was a knee-jerk response in the wake of the Black Friday firestorms. The bushfire-prone nature of our community should compel us all to frequently look towards better solutions for bushfire prevention and suppression. We need to heed the latest investigative bushfire research telling us what’s effective and what’s not effective, then exercise best practice. The research keeps reconfirming that hazard reduction is not effective. At the Adelaide Bushfire Conference 2004, research concluded that 90% of houses ignited in Australian bushfires are due to ember attack. ‘Hazard’ reduction does not prevent ember attack, so how does its stop the remaining 10%? 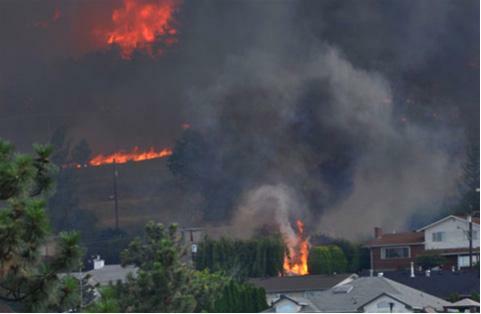 By walking around with petrol torches ‘hazard` reducing, volunteers are reducing habitat and reducing themselves to arson. Our actions need to respect both our built and natural assets. Most of us value our special Blue Mountains natural environment, otherwise why choose to live here and not in Portland or Pyrmont, where trees are scarce and concrete has eliminated bushfire risk? Research into the Warrimoo, Valley Heights and Yellow Rock bushfires of 2001-2 concluded that the main cause of houses destroyed by bushfire was from burning debris (ember attack) allowed to gain entry into houses through inadvertent openings. Houses-by-house, those that survived were due to vigilant intervention by those present putting out small fires after the fire front had actually passed. 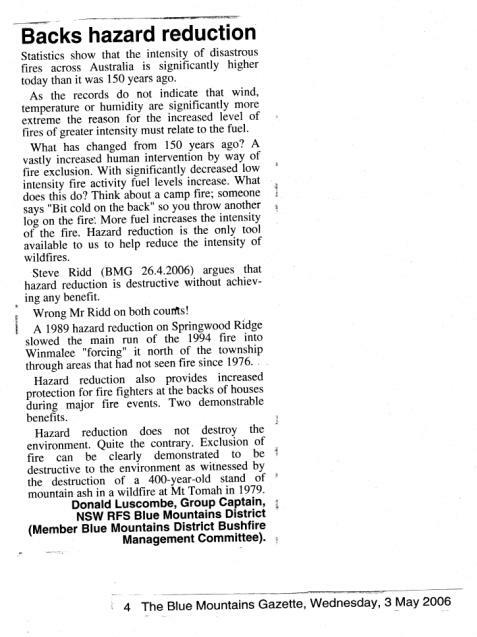 CSIRO Research (1999) into causes of building loss from bushfires in Hobart (1967), Blue Mountains (1968), Otway and Macedon Ranges (1983), and Sydney 1994) confirmed the same and advocated focus on landscaping and building design strategies. Out of the 2001/2002 NSW bushfires, Sydney Councils recommended Sydney Water increase mains water capacity during bushfire crises. Research literature is not widely promulgated, which means that the wider community must re-learn lessons in the wake of subsequent bushfires. Burning hedge, lit by ember attack. Photo © City of Kamloops, British Columbia, Canada. Perhaps like all residents, I wholeheartedly commend the dedication of RFS fire fighters fighting bushfires. 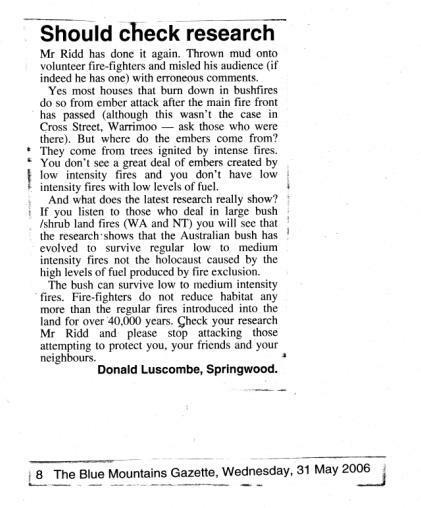 I reaffirm this in rebuff to the misrepresenting tirade from Blue Mountains Bushfire Committee boss, Mr Luscombe (BMG 31-5-06). The big local environmental issue continues to be the hundreds of Blue Mountains hectares cleared every autumn under the pretext of defending houses. Mr Luscombe agrees the main cause of bushfire damage to houses is ember attack AFTER a fire front has passed. But he contradicts himself by justifying the need for hazard reduction in autumn BEFORE the risk season even starts. 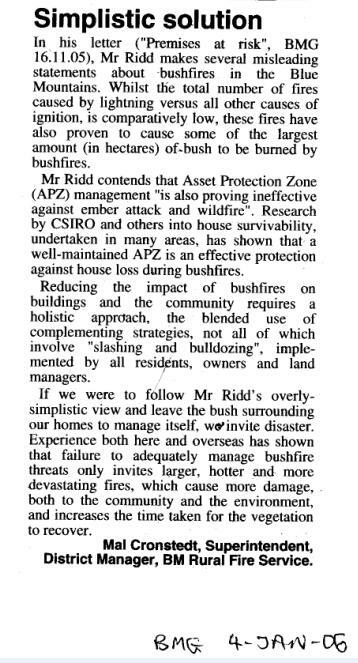 Clearly, hazard reduction is about thinning bush to minimise the intensity of a possible fire front, yet we agree the fire front itself isn’t the cause of house damage. Mr Luscombe is putting out the wrong fires. A sledgehammer approach to bushfire risk management won’t prevent wildfires or embers, but it will stuff forest ecology. I say it again – ‘hazard’ reduction is land clearing – an environmentally unsustainable practice all participants should critically question. Extensive field research by Catling (1991) of the CSIRO Division of Wildlife Ecology has shown that “vertebrate fauna of south-eastern Australia is most abundant in forests with a dense understorey.” “If shrubs, litter and ground cover are removed, reduction in complexity of forest structure leads to a reduction in abundance and species diversity of small mammals” (Lunney 1987, Royal Zoological Society of NSW). Frequent, low-intensity burns in autumn reduce and eventually eliminate dense understorey – because rain and warm weather needed for regrowth are denied. As understorey is lost, threatened ground-dwelling native mammals (Tiger Quolls, Eastern Pygmy Possums, Rufous Bettongs) lose habitat protection, while many exotic species (foxes, feral cats, black rats) are advantaged. On 28th April, ‘hazard’ reduction burning was prescribed for 347ha of the World Heritage Jamison Valley. Photo by editor 20061209 free in public domain.